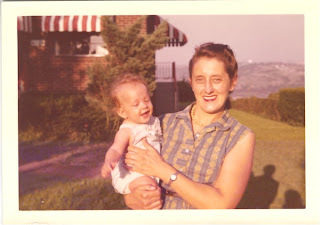 Here is a picture of my mom and my sister Kathleen c 1958, most likey the summer of 1958. I am thinking that perhaps that is when my grandmother Anna and her husband William Krah moved to Sarasota FL. They moved there after Anna's retirement. She did custodial work in an elementary school that was within walking distance to her home. Strangely, at some point in time they moved back to the Pittsburgh area. That must have been about 1966 or 1967. They bought a house in Uniontown PA. When they lived in FL they would go down for the winter and come up to PA during the summer. In 1969 my grandmother became ill. She had not been feeling well and was admitted to the local hospital. My mother got a call that she was being transfered to the University Medical Center. She had leukemia, and then with the brusing and bleedin she had a stroke and was unconscious. She would never recover and died in 1969, at the age of 69. My question now is, why did they feel the need to move back to PA? Did she feel that something was not right, or did they feel that they would not be able to make the trip back and forth much longer? Another thought. One of the papers I found on Footnote, my great grandfather Thomas Dowd and his brother in law Cummins Finnerty were sponsors for their other brother in law Thomas Mulroy. They were also for a man Patrick O'Toole, Patrick was married to a woman named Bridget, could this woman possibly be another sister of Thomas???? I have to investigate that possibility. Today is the anniversary of my mothers death, she died in 1995. She was born in Altona, Germany in 1923. My grandfather Willi Schridde and grandmother Anna Bartels came to this country in 1926. Gerda was four when she came. She remembered the ride on the ship. She said she could remember being on the deck eating a lollypop and a bee tried to land on it. Gerda also said she remembered seeing dolphins jumping in the ocean. When she landed at Ellis Island she had a cold and her mother told her "Don't cough they will send us back." My mother died fourteen years ago. She had two primary malignancies. The first was colon cancer, which was found early and considered a cure. The second was colangiocarcinoma, cancer of the bile duct, it was located just below the liver. This type is very rare, just about 1% of all malignancies. It was inoperable because of the location. The life expectancy was up to one year. With the modern techniques, the gastroenterologist inserted a stent into the bile duct, which then was able to drain the bile from the liver. Gerda lived four years and her quality of life was good, she only had a bit of pain the last month or two and she took some Tylenol with Codeine. It has been fourteen years and we still miss her very much. HIT PAYDIRT TODAY, SORT OF.. I had off today and decided to go to the LDS Church. It is about 10 minutes from my house. I was perusing the catalogue when the woman who was sitting next to told me about all she had found on Footnote. Seems the LDS Church has a subscription. I had joined Footnote on the one week free trial basis and did not find anything. What I did find was that my Great Grandfather (Thomas John Dowd) was sponsor for a lot of people. I found that he had sponsored about four people, those were just the ones that he had records for. The major one was of Thomas Mulroy, who I had just found the marriage record for Thomas and my Great Great Anut Catherine Dowd, who was now Mrs. Mulroy. Today I also found out that Thomas Dowd's middle name was John. 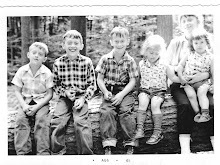 My cousin Walter had told me that the Dowd Family would go to New Jersey to visit some relatives. What I found was a petition for Michael Joseph Dowd, who GGF Thomas was also a sponsor, he had traveled to New York for that one. Michael was born in 1881, which was a year after Thomas came to the USA. I have to check to see if that is accurate, the printing is tiny. But I am really excited on my new find. It was an Eureka day. After having some anguish with my computer I am happy that I am now up and running. Today I went to the Carnegie Library to work on my marriages…I was looking for my Great Grandfather, Thomas Dowd’s sisters marriage. I found Catherine Dowd. Catherine married Thomas Mulroy on October 27, 1892. They were both born in Ireland and were twenty five when they got married. I talked to my daughter about that was considered to be “old” or a first marriage. Emily said Catherine was just probably “Picky” and waited for the right man. Who knows, maybe she was. They were both living in Port Perry, PA, which was in Allegheny County PA, it was a town on the confluence of Turtle Creek and the Monongahela River. There was just a question on one of my Roots Web list this week and I was surprised to find I had ancestors who lived there. I had taken some pictures of the microfilmed documents. I have to download them and see if I was successful, what I probably needed was a tripod. This is a picture of my Great Aunt Anne. She was born 10 November 1875. She was the eldest of the O’Rourke children. I had this picture with my dads things. My newly found cousin Joanne, was able to tell me who it was because Anne was her grandmother. She was married first to Charles Forgie, He died at an early age. She had one son to Mr. Forgie I have to find out how he died. Then she married to Peter Zentner and they had five children. The child above is her first Zentner child, Leo. Mr. Zentner died early also. Anne’s other children were William, Mary, Ellen and Rita. They are all gone now and I remember them all. The photo must have been in a round picture frame. I like the velvet choker and her Gibson Girl upsweep. If you look closely it appears that there was someone else in the photo. I wonder who it was and why they were removed? 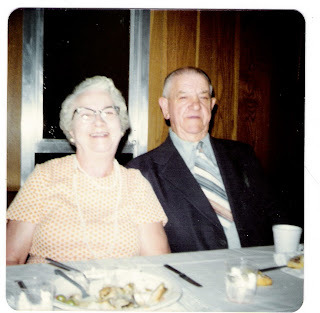 This is a picture of my grandmother, Gertrude O’Rourke, brother William. He was born in 1888 and died in 1979. This picture is an old photo. The original has sort of a metallic sheen and is very reflective. I do not know what it is made from. Uncle Bill never married, he stayed at home to take care of his mother and father. After they died he stayed with his two sisters Mary O’Rourke and Gertrude O’Rourke Dowd. Gertrude got married a second time to Pete Graham and after his death moved in with Bill and Mary. I never did figure that one out. In his later years he had a stroke and went to live with my mom and dad. He would be able to get around and still sit on the porch listening to Pirate Baseball. This is a picture of Uncle Bill in 1958 holding my sister Kathy. Uncle Bill spent his like working at a soft drink bottling plant and then for Westinghouse in their electric shop. John and Mary at their 60th Anniversary. 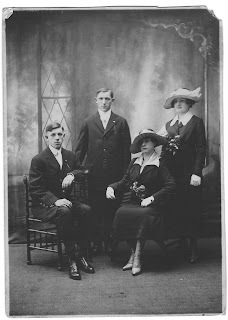 Almost wordless, John Sperl and Mary Stephens wedding circa 1919. John and Mary in front row. 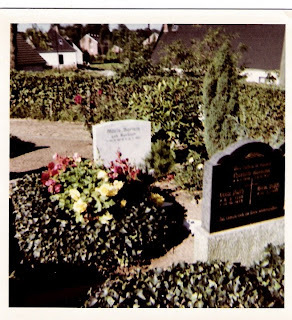 This is the grave of my great grandmother Maria Anna Johanna KORBACH Bartels. She died somewhere in the 1960's. She is buried in Germany, but where I do not know. I know she was originally from Jena and I remember seeing post cards from Bremerhaven, now if they were hers I do not know. I found a post card from my grandmothers sister in law Lily Clausen who also lived in that area. I have tried to enlarge the photo to see if I could see her dates but I am unable to do that. I guess I need the sort ware that the forensic eople use..
Today I will follow another of Amy's ideas. It is #15. Earlier this week I received the death information on a Loreto O'Rourke. To my surprise the parents were listed as my Patrick O'Rourke and Ellen Mortel. Her name was Loretta, she had died from fever in November of 1894, her age being two. Now the mystery. 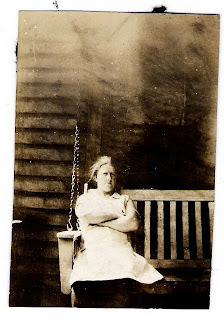 My grandmother Gertrude had always said that her birthday was 5 October 1892. On the information from the Diocese of Pittsburgh it has listed Gertrude's birthday as 18 May 1890. The next child is listed as Bridget, born 5 October 1892, which Gertrude had said was her birthday. I remember it because October is my birth month and we would celebrate the month. How did the switch happen..was Gertrude aware or it? Each answer is an enigma. Were there so many children that it was difficult keeping each ones birthday straight? I guess another trip to the Carnegie Library is on the agenda, quite possibly on Saturday. The picture is one of Gertrude. I think the photo is old because of the sepia color. In this picture Gertrude is of undetermined age, but I have a suspicion that she is much younger than she appears. I read a blogging idea written by Amy at WE TREE about thing to write if you if you run out of ideas. I am always looking for ideas, and she had many listed. It may keep me busy for the year. This is a picture of my great grandparents. Heinrich Theodor Fredrick Schridde and Anna Meta Margarethe Hackmann. The man in the back in his German WW I uniform is my grandfather Willi Schridde. He was born in Quickborn Germany in 1898. I was writing to a gentleman who had the Schridde name in his family tree and he helped me by contacting the authorities in Quickborn and I was able to get the name of my great grandparents. They did not live in that town and left a little while after Willi was born. I will be forever thankful to him for helping me find their names. We think the families are related but it must have been generations ago. Willi had five sisters, Johanna, Una, Mina, Dina and Lily. Lily married Herr Clausen. I have some water color prints by Helmut Clausen. I do not know if that was her husband or son. The ironic thing about that is I also like to paint watercolors. Johanna was listed as a witness at my grandparents wedding. I know the sisters names but not who they were. This is a mystery I would love to solve. I found this picture at my sister Kathy’s house a few years ago. She said it was out great grandparents and our mother had given it to her. I had to have a copy. It is my hope sometime someone in Germany will recognize the people and contact me about the family. I have been wondering why there were two markers with P. O’Rourke. The second one actually has my great grandparents names on them. Was the P. O’Rourke a stone from long ago, then why the second? Patrick was the last to die so his children had to buy both. Is it because this could be the place where the missing children are buried. I know of Loretta, Dennis and there were two others according to the census records…I do not know their names…..could one be another son Patrick? The bottom stone looks much older than the one with both names on it. This is another enigma in my search.